OpenBlooms is a locally owned, family-operated and community-minded small business. As such, we are involved with a number of local organizations and events. We are pleased to be a floral sponsor for the following events in Northern Virginia. The 7th Annual Boots, Beer & BBQ will take place on Friday December 7th, 2018 at 6:30 pm. This event will include live music, local food, beer and wine. This is a fundraising event to raise funds for the Loudoun Free Clinic, which provides free medical care to low-income, uninsured adults in Loudoun County. OpenBlooms is thrilled to support this exciting event. Please visit http://www.loudounfreeclinic.org/bootsbeerbbq.html for more information. Just outside of Ashburn VA, the Loudoun County Chamber of Commerce Small Business Awards celebrate Loudoun County’s best small businesses, entrepreneurs and nonprofit organizations. 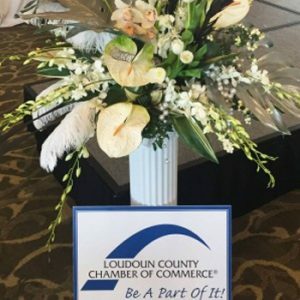 More than four hundred Loudoun businesses and community leaders will be present as the winners of ten categories are announced. OpenBlooms is proud to be the floral sponsor for this prestigious event. The Small Business Awards will take place on November 2nd at 5:30pm. Please visit http://www.loudounchamber.org/SBA for more information about this event. The Virginia Women’s Business Conference brings together over 700 women (and men) across a wide range of industries. This conference gives business leaders the tools necessary to advance and grow their personal objectives, business goals and increase sales. The conference provides a unique opportunity for women business owners in Northern Virginia to make meaningful connections and real-life partnerships. Open Blooms is happy to provide the floral arrangements for this event. The Virginia Women’s Business Conference will take place on Friday, December 1st. For more information about this event please visit http://www.virginiawomensconference.com. The 59th Annual Fall Fashion Show is a fundraising event held by the Herndon Woman’s Club. The money raised by this event will go directly to Luke’s Wings. Luke’s Wings brings family members to the bedside of wounded warriors, veterans and heroes. This provides much needed comfort and support during surgery, recovery and hospice care. Open Blooms is pleased to support this wonderful event. The 59th Annual Fall Fashion Show will take place on Saturday, November 11th. Please visit http://www.herndonwomansclub.org/fall-fashion-show.html for more information about this event. In addition to these great events, OpenBlooms is proud to sponsor the First Responder Luncheon at the Police Station in Reston Town Center. The Reston Chamber of Commerce puts on this fantastic event. OpenBlooms is dedicated to providing exceptional flower delivery to our Northern Virginia community. Please contact us for more information.